Yes, almost certainly Pholcus phalangioides. Many thanks for the details. 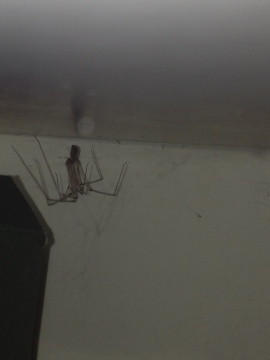 Is this a Daddy-Long-Legs spider? Thanks Peter. It was always going to be a long shot making an identification of this spiderling from a photo. With it being so small i soon lost sight of it so i only ended up with a couple of half decent images. 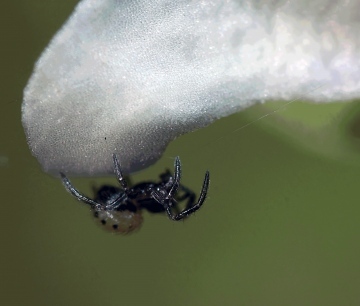 This is a tiny spiderling, unidentifiable to species, and I am not even sure of the family from a photograph. I am looking to identify this Spider. As i recently got back into macro photography i am always seeking out insects, Spiders and really all matter of tiny creatures that share their world with us right under our feet. When i was out in our back garden on Friday i came across this little guy. I had never seen a spider so small and only noticed it as it caught the sunlight moving across a fine silk strand. Just looking at it through my eyes i could hardly see what it was, at 1st i thought it was a small mite. Approx 1mm in size, maybe even a little smaller. It just looked like a speck of dust with legs moving across the silk strand. It was not until i got the camera close into it that you could then make out what species it was. 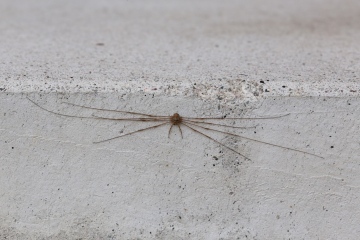 I have been searching through many images throughout the past few days online but as yet have failed to find anything remotely close to what this species of spider is. Help getting an ID on this little guy would be great. I do know though that it is not always possible to make a positive ID from a photo but i am keeping my fingers crossed it can be identified. The spider s photographed on the edge of a Pansy petal. Any suggestions or information is appreciated thank you. Yes, this is Dicranopalpus ramosus. Can you please provide a full postcode or Ordnance Survey grid reference so that your record can be added to the recording scheme. Found this on my doorstep today. I believe it is Dicranopalpus ramosus. Amazing to think it has only been in Scotland for 15 or so years!